ATHENS, Greece, Oct. 19 /CSRwire/ - The “Sustainability Forum 2018”, a training, networking and professional development event, took place on October 5 for the seventh consecutive year. 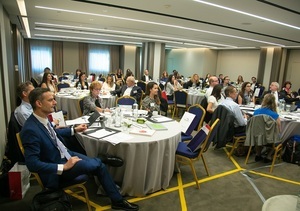 The event was organized by Global Sustain and held at the NJV Athens Plaza Hotel. For another year, world renowned speakers and sustainable development experts from high profile organizations participated in the event and through special sessions, shared their knowledge and experience with the attendees. Speakers came from the following organizations: Cambridge University, AHC Group, Trucost - S & P Dow Jones Indices, Rockwool Group, Carbon Clear, AstraZeneca, FMC Corporation, Osiris Labs, Shumaker Loop & Kendrick LLP, Trillium Asset Management, Walgreens Boots Alliance and GRI. Attendees had the opportunity to be informed about critical issues but also about international trends while participating in an all-day networking. Τhe SF Tour was held for another year, offering participants a complete sustainability experience through educational activities, networking and leisure. This year's destination was Chania, Crete, and the participants had the opportunity to visit traditional olive oil production facilities, handmade soap from organic pure materials production facilities, and a recycled glass blower factory.